One day after LA Councilwoman Janice Hahn told an audience in Venice that "Campaign decisions should not be happening in American's boardrooms. We need far tighter curbs on corporate campaign expenditures." the LA Times is reporting that The Cooperative of American Physicians IE Committee, a PAC which represents medical malpractice insurers, has spent over $50,000 on mailers to support her in the CA-36 race. In documents filed with the Federal Election Commission, the Cooperative of American Physicians said it spent $51,092 on a mail campaign advocating the election of Los Angeles Councilwoman Janice Hahn. Hahn is one of 16 candidates on the May 17 ballot to replace former Democratic Rep. Jane Harman of Venice. The physicians group is apparently the first to make a so-called independent expenditure in the 36th Congressional District race. 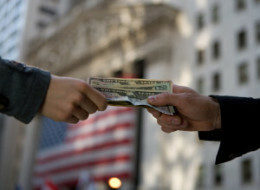 Groups are allowed to spend unlimited amounts to support or oppose a candidate so long as they do not coordinate with the candidate's own campaign. Hahn so far has led the pack in fundraising, outpacing even Secretary of State Debra Bowen, believed to be her strongest competitor for the seat. About half of Hahn's contributions appear to come from lobbyists, developers and others doing business with the city. The next campaign finance reports are due at the FEC on May 5. Frankly, I think the LA Times is being conservative in their estimate. Dig a little deeper into the numbers, and you'll find that over 70% of Hahn's donations comes from LA City Hall contractors, lobbyists, the nuclear industry and rent control opponents. A year ago, this same PAC partnered with oil, tobacco and other special interests to go after 53D Assemblymember Betsy Butler in the June 2010 primary. The association, which has spent more than $180,000 to oppose Butler, lists among its 56 board members Altria (parent company of Philip Morris USA), Anthem Blue Cross, Apple Computer Inc., BP,the California Apartment Assn., ExxonMobil Corp., GlaxoSmithKline, Southern California Edison and State Farm Insurance Cos.
Two other committees involved in the campaign against Butler represent medical malpractice insurance interests: California Allied for Patient Protection (which has spent $148,522) and the Cooperative of American Physicians (which has spent $150,000). So far, no outside groups have reported independent expenditure campaigns for other candidates in the CA-36 race. OK, well maybe not everything, but enough to help you make up your mind by May 17th, the date of the special election to chose who will represent us in Congress. But first, a few housekeeping notes. With the special election only three weeks away, many of you will start receiving absentee ballots this week. Here's a helpful hint: The sooner you fill out the ballot and mail it in, the sooner you'll stop getting those annoying phone calls and mailings from the campaigns. Campaigns actually keep track of that sort of thing so they don't end up wasting money on people who've already cast a ballot. If you aren't registered to vote, it's not too late. You have until May 2nd to get your voter registration in! Click here to begin the process of registering to vote. When you're done, print out the form and mail it to: Los Angeles County Elections Office, P.O. Box 1024 Norwalk, CA 90651-1024. You can also obtain a voter registration form at most County buildings, city halls, fire stations, libraries, State Motor Vehicle Offices, Public Assistance Offices (DPSS, WIC), and post offices. Don't know where your polling place is? No problem! Click on this link, then fill out your street number and street name to find out where it will be for the May 17th special election (I highly recommend you do this - don't assume your polling location will be the same one from the last election). 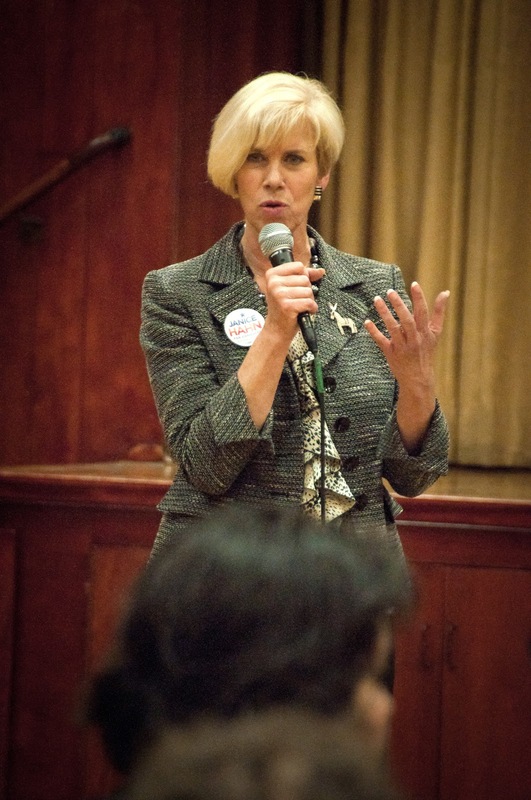 When Jane Harman first announced her resignation, at first I didn't know who I'd support in the race to replace her, even after one candidate, LA Councilwoman Janice Hahn, called me up the next day asking for an endorsement. Now, if I learned anything over the last couple of years of community organizing it was this: an educated voter is an empowered voter, and an empowered electorate holds the key to real and positive change in this country. So I did my homework. I searched the internet, I talked to people I trusted or who knew the candidates, I found old articles and news stories, I even (gasp!) visited my public library to find information. When I was done, the choice could not have been more clear. 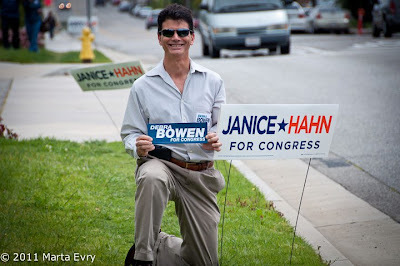 See, when Janice Hahn called me up looking for my endorsement, I told her at the time that I'd be happy if either she or Bowen ended up in Congress. At the time, I absolutely meant it. But after doing the homework, I no longer feel that way. Choosing Bowen over Hahn became the choice between the transformational vs. the transactional, between having a partner in congress or having a broker, between having someone who is willing to stand up for what is right in spite of the consequences or having someone who will be buffeted by the competing wishes of special interests. But I don't want you to take my word for it. 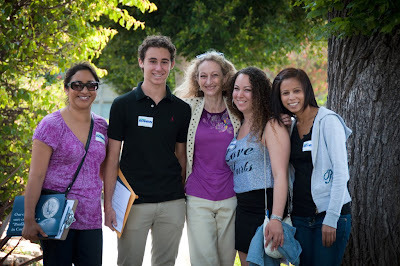 Since Debra Bowen is the only candidate in this race with legislative experience (having already represented our district for 14 years, first as an Assembly member then as a State Senator in the California legislature) it wasn't hard to find a lot of information about her record online. So below I'm sharing with you links to the same sources I used during my research. If you want to learn more about Debra Bowen, I encourage you take a few minutes to educate yourself. If Janice Hahn's congressional campaign contributions are any indication, her relationship to lobbyists and California's power brokers is a comfortable one. According to FEC reports, over 60% of Hahn's campaign contributions came from lobbyists, PACs and corporate interests, including high-powerd Los Angeles developers Eli Broad and Rick Caruso, who donated $2,500 a piece, $10,000 from Edison International (which owns a 78.2% stake in the San Onofre nuclear power plant ) and $2,500 from the National Apartment Association PAC, an association which lobbies against rent control. NAAPAC's local affiliate, the Apartment Association of Greater Los Angeles, seems particularly proud of it's fight against "socialized housing"
But in terms of history and influence, no single lobbyist or corporate interest hold's a candle to Ek & Ek, which just donated $8,000 to the Hahn's campaign coffers. Sergio Carrillo used to be a staffer for Janice Hahn. He left to work for Ek & Ek. From there, he went to an Ek client, Yellow Cab. Hahn's new chief of staff, Doane Liu, came from Triple E Associates. "The person [Hahn] goes on vacation with is John Ek's wife," says Pat Nave, a San Pedro activist who opposes the Ponte Vista development, which Ek was hired to support. "Most people know it and don't care. That's the way this town is. It's incestuous as hell." Political contributions add another layer of influence for the Eks. Since 2004, Ek & Ek has raised $165,000 for city campaigns. When Janice Hahn ran for lieutenant governor last year, John and Esther Ek each gave the maximum $6,500. Eight Ek & Ek clients gave another $34,000. When Hahn announced her campaign for Congress earlier this year, John Ek hosted a fundraiser for her in Washington and another in downtown L.A. But so what? Hahn, who declined to comment for this article, has previously said that such relationships don't influence her decision making. The story goes on to describe how Hahn, with Ek & Ek's guiding hand, meddled in the LAX food concessions bidding process - and helped overturn a $600 million bid with SSP America, which included local eateries such as Bertha's Soul Food and Venice's Groundworks Coffee. In the end, Ek & Ek's corporate client and current concessionaire, HMS Host, got to hold on at LAX as bids once more slowly wound their way through City Hall. "The thing about John Ek is he was incredibly effective," says Nick Karno, owner of Groundwork Coffee, which was part of SSP's bid. "He effectively shut down the bidding process. He delayed the thing for probably a year. And they were clearing $20 million a year out of LAX. So they got their money's worth out of him, that's for sure." An internal poll released by the Bowen campaign shows the candidate tied with Councilwoman Janice Hahn in the CA-36 primary. Marcy Winograd - who received 41% of the vote against Jane Harman in the 2010 primary race - is only polling at 6%, putting her in 4th place behind Republican Mike Gin. In an initial match-up between all of the declared candidates, Bowen and Hahn are tied at 20 percent each, with the closest candidate, Mike Gin, at 8 percent. 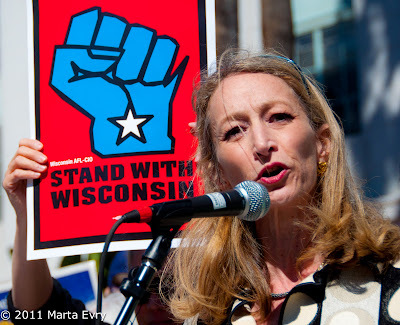 Marcy Winograd, another Democrat in the race, receives only 6 percent support. Twenty-four percent of the electorate remains undecided. Bowen dominates in the Beach Cities and Venice with a double digit lead over both Hahn and Winograd, and leads in all geographic regions except the Harbor area.. In a run-off matchup between Bowen and Hahn, Bowen (40 percent) pulls ahead of Hahn (36 percent) without any messaging. Sixteen (16) percent are currently undecided. While Hahn may have an advantage of name recognition in the district it is not translating into an advantage in votes, perhaps because her unfavorable rating is double that of Bowen. Democrats continue to hold an advantage in this district. Voters in the district are more likely to prefer a Democrat (41 percent), and 29 percent say they would prefer a Republican with another 27 percent say that the candidates party doesn’t really matter. Bowen shows her strength over Hahn among Decline-to-State voters, receiving 47 percent of the vote. Bowen’s lead over Hahn grows even after voters are informed about key endorsers for each candidate (including Feinstein, Lieu, Nakano, Firefighters and others for Hahn) and positive arguments being used by the respective campaigns. With a July 12th runoff virtually assured, a couple of points jump out at me. At 24% in the primary, the number of undecideds in this race are a huge factor. Hahn has high name recognition, but she also has relatively high negatives - twice that of Bowen - and Hahn's endorsements don't seem to have had much effect on her polling. The Feldman Group conducted the poll among 451 registered likely voters in California Congressional District 36 from April 4-7, 2011. The sample consisted of 401 registered likely voters and an oversample of 50 DTS voters. The margin of error for a sample of 401 is ± 4.9%. "We're stunned that Bowen would release a poll that shows 80% of the voters she represented for 14 years rejecting her." said campaign manager, Dave Jacobson. OK, forget the fact Jacobson apparently can't do math (24% of voters are undecided about anyone yet), did he really mean to highlight that an equal number of Hahn's current constituents have rejected his boss? Bolstering their status as the presumed frontrunners in the crowded special election for a South Bay-based congressional seat, Democrats Janice Hahn and Debra Bowen have outdistanced their rivals in campaign contributions, reports filed with the Federal Election Commission showed Friday. By the March 31 close of the reporting period, Hahn had raised $274,443 and spent $103,177, while Bowen had collected $195,224 and spent $102,227. Bowen, who is California's secretary of state, and Hahn, a Los Angeles councilwoman, are vying to succeed former Rep. Jane Harman (D-Venice) in a district drawn to favor Democrats, who hold a nearly 18-point registration edge. But Republican Craig Huey, owner of an advertising firm, had more cash at his disposal than Bowen and came close to matching Hahn's money by lending his own campaign $250,000, according to his FEC report. He spent $155,695 and reported raising $1,727 in contributions from others. While fundraising numbers as a metric of potential success are unreliable (Meg Whitman anyone?) and are an incomplete and constantly moving target (Debra Bowen raised an additional 40K just outside the reporting period thanks to a drive sponsored by Howard Dean), they can still provide some valuable insight into a campaign's strengths, weaknesses and priorities. One meme I hear in the press a lot is that the race between Hahn and Bowen boils down between Hahn's "beer-track" blue-collar union support versus Bowen's more affluent "wine-track" coastal support. But if the latest fundraising figures are any indication, Hahn's support is more like "LA City Hall/Veuve Clicquot-track"
If you wish to send a note offering condolences, you may send it to the CA36 Congressional office in El Segundo. 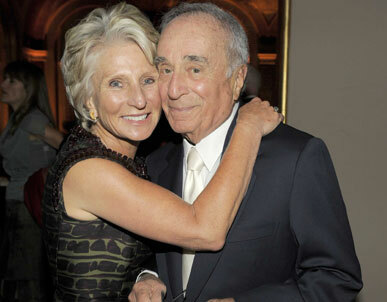 Jonathan Alter's moving piece about Sidney Harman's extraordinary life can be read at this link. Today's post is a follow up of a fundraising analysis I did last month of the three leading Democratic candidates. On March 18th, Janice Hahn lead Debra Bowen, and Marcy Winograd had barely raised any money at all. Today, just three weeks later, the picture on Act Blue looks a lot different. In monetary terms, Marcy Winograd showed the greatest improvement by far, a whopping 2,159%. She also added 250 donors to her fundraising base. Her per average donation also shot up, from $38.82 to $105.02. It's important to note that Act Blue accounts for only a portion of a candidate's fundraising efforts (I've heard estimates of anywhere from 10% to 30%), but as an indicator of fundraising progress it's probably pretty representative of where the candidates are in relation to one another. The LA Weekly characterized the race between Bowen and Hahn as "Green vs. Blue", with Hahn's base being blue collar labor and Bowen's being more affluent coastal Democrats. I think the fundraising totals we see on Act Blue tell a somewhat different story, however. Hahn's donors have by far the deepest pockets, donating nearly 4 times as much per person as Bowen's donors. Even Winograd's supporters have deeper pockets. Janice Hahn says she's all about jobs. Jobs are the first thing you read about on her website, (" I'm running for Congress to create new jobs.") It's in nearly every campaign press release, ("I will be a fighter for workers!") And it's the first thing she talks about on the campaign trail, “If the subject is jobs, I don’t know anybody who has a track record as I do of creating good jobs. ", Hahn told a gathering of moms in Mar Vista. Yet in January - two days after attending President Obama's State of the Union speech as Jane Harman's guest - Hahn abruptly withdrew her support for a shipyard at the Port of Los Angeles that only 20 months before she'd touted would deliver a thousand "well-paying clean energy jobs, renewed economic activity, and a new standard for environmental stewardship." Public records available online and news reports published at the time tells us what happened in those intervening 20 months. It's a complicated tale, featuring an ambitious termed-out LA City councilwoman, conflicting agendas between the Port of Los Angeles and the shipbuilder, Gambol Industries, intramural union warfare, maxed-out, suspiciously-timed campaign donations, accusations of influence peddling, and nearly two years worth of squandered goodwill. 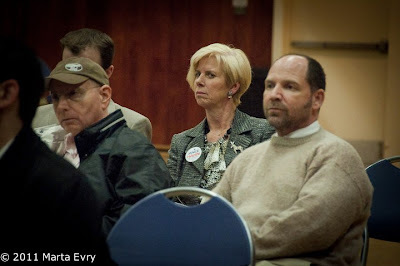 "The Only Thing Grassroots Is The Lawn Outside The Building"
This last Saturday, while most normal people did things like ride bikes, go shopping, or play ball with their kids, my husband and I trudged down to the Torrance airport to vote in the California Democratic Party CA-36 Endorsement Caucus. While this may sound like a condition best treated with penicillin, it was instead another milestone on the way to the May 17th special election to chose a new representative for our Congressional District. At stake was the official endorsement of the CDP. Or, as I like to call it, "The Coveted CDP Door Thingee", because if you're a registered Democrat in the district, some helpful soul will hang a brochure on your front door before election day listing official CDP endorsements. Debra Bowen, Janice Hahn, Marcy Winograd and a fourth candidate who'd just registered the week before, Dan Adler, were all in competition for the Coveted CDP Door Thingee. And as predicted, all left that day empty handed - no single candidate had the 60% needed to snag it. Yet, less than 15 minutes after the vote was tallied, a press release popped up on my iPhone from Janice Hahn's campaign manager. The lede, "Hahn Secures Majority Vote of Party Faithful; Vote Solidifies Hahn as Grassroots Choice for Congress"
The first part of that statement was absolutely correct. Janice Hahn received more caucus votes than any other candidate in the room that day. Hahn got 65 votes, Bowen, 46, and Winograd, 2. I know the words "caucus endorsement vote" sounds like a quaint exercise in democracy, conjuring up Norman Rockwell images of citizen-delegates thoughtfully debating the merits of the respective candidates and casting their votes for the one they think will best represent the district. In reality though, the endorsement process is an exercise in back-room deals and hard-ball machine politics, the outcome mostly preordained, with delegates appointed, strong-armed, and horse-traded like baseball cards. In other words, it's everything voters hate about politics. As one election observer remarked after reading Hahn's email, "The only thing grassroots about it was the lawn outside the building." More on the sausage-making below the fold. Today, House Budget Committee Chairman Paul Ryan (R-WI) introduced a 10-year budget proposal that would essentially eliminate Medicare and Medicaid, replacing it with a voucher and managed-care system that would drastically curtail benefits for the poor, disabled and elderly. "This is not a budget. This is a cause," Ryan said yesterday on Fox News. "We are here to try and fix this country's problems. If that means we are giving our political adversaries a political weapon to use against us... shame on them. We owe it to the country to give them an honest debate." "Let's be clear: these are not simply 'cuts,' and this is not simply 'reform.' This is fundamentally abolishing Medicare as we know it and replacing it with a voucher system -- one with no cost controls which will force seniors to pay a greater and greater share of their medical bills out of pocket over time. "While the Ryan Budget is a sweet deal for private health insurance companies and multi-millionaires, it breaks the faith with America's seniors and the tens of millions of working class Americans who have paid into Medicare their whole lives. It should not be passed." The prospects for California would be pretty grim. Low-income Medicaid beneficiaries will lose their guaranteed benefits altogether. Currently, Medicaid is a shared responsibility between the federal government and states, which are required to provide comprehensive health care benefits to people in poverty. Ryan's plan turns the program into block grants for the states -- with no guarantees. Cash-strapped states like California would likely be forced to drop beneficiaries from the rolls should the plan become law. So a funny thing happened on the way to my Facebook account. Janice Hahn unfriended me. Not just unfriended me, but blocked me. The internet equivalent of wishing me into the cornfield. Turns out I'm in good company. Last week, LA City Council member and Lt. Gov candidate Janice Hahn told us that she was canceling her LA Times subscription after the Times endorsed SF Mayor Gavin Newsom. Not only that, Janice told us, she canceled her MOTHER'S subscription, too, saying she didn't want a whiff of the LAT's musk on her doorstep. Instead, she said she would read The Chronicle. Well, The Chronicle's subscription department is bracing for some more bad news Monday: The Chronicle's editorial board endorsed Newsom Monday, too. So did the Sac Bee's ivory tower posse the other day. Reminder: Reporters don't make the call on endorsements. That's the purview of the edit board, done indepedently from us. A call is in to Team Hahn. We await the response. While all of this is pretty funny, if elected to represent the district, Hahn's going to have to get used to the idea of representing everyone in the district, not just those who agree with her. Hahn's proclivity for sweeping critics (critics, not crackpots) under the rug and out of sight ought to raise some red flags for voters. ed note: Today Venice For Change is honored to welcome Lindsey Horvath to the blog. From May 2009 to March 2011, Lindsey served on the West Hollywood City Council. She currently serves as President Emeritus of Hollywood NOW. When Lindsey read this story about how Janice Hahn called into question Debra Bowen's party loyalty because she wasn't born a Democrat as Hahn was, Lindsey felt compelled to speak out. I have a confession to make: I am not a lifelong Democrat. I did not wear a "Tiny Democrat" onesie while my dad marched with Dr. Martin Luther King Jr. My mom did not take me to CR groups. Admittedly, I think it would have been pretty fascinating to be that kid...but I wasn't. Instead, I grew up in a conservative, Midwestern Catholic family, and I was instilled with a deep commitment to the ideas of family, faith, and freedom. My dad was the first generation in his family to go to college, and my mom was a homemaker who welcomed us home from school and made dinner every night. My faith shaped my commitment to treat others as I would want to be treated, and to be of service to those who are oppressed and in most need. My grandfathers served in WWII, and my uncles served in Vietnam and Korea, so I developed great respect for the service and sacrifice so many generations have made for my American freedoms. Naturally, when I was 18 and had the chance to register to vote in my first election, I chose the Party that professed a commitment to family values, God, and service to one's country. I joined the College Club for that Party and actively participated, as I believed it was my duty to be civically engaged. I was tired of hearing how young people didn't care, and I felt morally obligated to help people understand why voting was so important, particularly in that election. As a Political Science and Gender Studies double-major, however, I received quite an education. I learned much more about my Party - that they did not stand by their stated commitment to education, to our aging population, or to our Christian mission to "help the least among us." I learned that they were, in fact, the most likely Party to advocate against the interests of low- and middle-income Americans; that they were selective in the families they valued; and that they were quite interested in preventing the advancement and equality of women in society. I learned that I was wrong about my Party - utterly and completely wrong. So I changed my registration and became a Democrat. I felt an even greater responsibility to work hard and make sure people did not make the same mistake I had once made. I vowed that I would continue to work for all the values I had always held - protecting our environment, our working class, our seniors and ALL of our families; ensuring access to quality education and affordable health care; empowering women, gender minorities, and our youth. For some people, however, this isn't enough. Recently, I ran in an election where my Democratic opponents suggested that my former Party affiliation spoke louder than my years of activism and accomplishment on a variety of progressive issues. I was expecting the attack; after all, when one runs for public office one has to assume that opponents will eagerly dredge up the past. But I found remarkable how many registered Democrats - and even some leaders within the Party - placed more value on my political indiscretion as an 18-year-old college freshman than on the decade-long promotion of progressive ideals that followed it. These same attacks are being made against California Secretary of State Debra Bowen in her race for Congress, and against other non-lifelong Democrats like us, who work hard every day to advance the values of our Party. Even Secretary of State Hillary Clinton experienced a Democratic conversion in college: she was President of the College Republicans at Wellesley, and yet we do not place asterisks next to her accomplishments as First Lady, Senator, or Secretary of State because she registered with another Party decades ago. While we certainly value those who have made a lifetime commitment to the Party, the successful leadership of non-lifelong Democrats demonstrates that we are a Party committed to progress and that we believe change truly is possible. When we effectively advocate for our issues, and we help people understand why they need to support Democratic values, we must welcome the converted as much as those baptized by the Party at birth. The Democratic Party is best served when we support people who are willing to do the work and fight for progressive values, regardless of when they joined. We cannot brand new Democrats with a political scarlet letter, thus engaging in the destructive politics of our opponents. We must set the example that political party conversion to becoming a Democrat is to be celebrated, much like the Parable of the Prodigal Son. Today, I take ownership of my Party affiliation and the values I represent as a member of it. As a Democrat, I value that we are "a big tent," welcoming to a diverse group of people who care about including and empowering those who have been disenfranchised. And I will work hard to make that tent as big as possible, so we can include all those who want to call the Democratic Party their home. Less than a month after Janice Hahn's allies in City Hall conducted a whisper campaign questioning Debra Bowen's stand on marriage equality, now it's Hahn herself leading the charge. This time questioning Bowen's loyalty to the Democratic Party. One day before a Democratic special endorsing caucus meets to officially support a candidate in the 36th district special election, Los Angeles City Councilwoman Janice Hahn’s campaign is presenting her as the only true Democrat in the race. It turns out California Secretary of State Debra Bowen was once a Republican. The Hahn campaign hinted in a press release that she is the only Democratic candidate who has never been a member of another political party as it trotted out the endorsements of four officers of the state Democratic Party. Debra Bowen was a registered Republican until 1984, then switched party affiliation to become a Democrat. In 1992, during her first successful run for the California Assembly, she told the LA Times she made the switch because the Republican party lacked "compassion and tolerance and respect for others." She has remained a Democrat ever since. Observers familiar with the race aren't convinced Hahn's charge will hold up to scrutiny. "Hillary Clinton was a Goldwater girl. Janice Hahn was a Clinton delegate in 2008. Does she want to renounce that endorsement because Clinton wasn't 'always a Democrat'? ", said David Dayen, a writer for FDL News who's covered California politics extensively. Current party affiliation hasn't always been a deal breaker for Janice Hahn either. Recently she endorsed Republican Mitch Endglander in the March 8th LA City Council race. An official California Democratic Party endorsement would be helpful to a candidate as they compete for votes in the crowded, bipartisan field. A candidate would have to garner 60% of the caucus votes to win the endorsement. Janice Hahn is reportedly worried enough about the endorsement that she showed up unannounced on delegate's doorsteps this week hoping to sway their votes. As she did in the Lt. Governor's race against Gavin Newsom, Janice Hahn has shown no hesitancy to go negative in this race early and fast, whether it's baiting Marcy Winograd into joining the race with the hope her candidacy would cut into Bowen's votes, or conducting whisper campaigns questioning Bowen's stand on marriage equality and party affiliation. However Hahn's strategy may backfire. Even though party registration in this district leans Democratic, the May 17th special election runs under "open primary" rules, where voters can cast a ballot for any candidate regardless of party affiliation. Historically, Bowen's appeal has crossed party lines, especially with pro-choice Republican women, who helped Bowen win her first Assembly race in 1992 when the district was still majority Republican. Hahn also runs the risk of turning off Democratic voters who see Bowen as a hero for her work on election protection and government transparency. "It just smells," said Tony Salvaggio, a registered Democrat and party delegate from Manhattan Beach, "We should be debating facts, issues, and who's better qualified for the job, not what somebody's party affiliation was 27 years ago."